This section describes XAPI managed hypervisors, and how to use them with OpenStack. A hypervisor that provides the fundamental isolation between virtual machines. Xen is open source (GPLv2) and is managed by Xen.org, a cross-industry organization and a Linux Foundation Collaborative project. Xen is a component of many different products and projects. The hypervisor itself is very similar across all these projects, but the way that it is managed can be different, which can cause confusion if you're not clear which toolstack you are using. Make sure you know what toolstack you want before you get started. XAPI is one of the toolstacks that could control a Xen based hypervisor. XAPI's role is similar to libvirt's in the KVM world. The API provided by XAPI is called XenAPI. To learn more about the provided interface, look at XenAPI Object Model Overview for definitions of XAPI specific terms such as SR, VDI, VIF and PIF. OpenStack has a compute driver which talks to XAPI, therefore all XAPI managed servers could be used with OpenStack. XenAPI is the API provided by XAPI. This name is also used by the python library that is a client for XAPI. An Open Source virtualization software which includes the Xen hypervisor and XAPI for the management. For more information and product downloads, visit xenserver.org . A Xen host runs a number of virtual machines, VMs, or domains (the terms are synonymous on Xen). One of these is in charge of running the rest of the system, and is known as domain 0, or dom0. It is the first domain to boot after Xen, and owns the storage and networking hardware, the device drivers, and the primary control software. Any other VM is unprivileged, and is known as a domU or guest. All customer VMs are unprivileged, but you should note that on Xen, the OpenStack Compute service (nova-compute) also runs in a domU. This gives a level of security isolation between the privileged system software and the OpenStack software (much of which is customer-facing). This architecture is described in more detail later. A Xen virtual machine can be paravirtualized (PV) or hardware virtualized (HVM). This refers to the interaction between Xen, domain 0, and the guest VM's kernel. PV guests are aware of the fact that they are virtualized and will co-operate with Xen and domain 0; this gives them better performance characteristics. HVM guests are not aware of their environment, and the hardware has to pretend that they are running on an unvirtualized machine. HVM guests do not need to modify the guest operating system, which is essential when running Windows. In OpenStack, customer VMs may run in either PV or HVM mode. However, the OpenStack domU (that's the one running nova-compute) must be running in PV mode. Domain 0: runs XAPI and some small pieces from OpenStack, the XAPI plug-ins. OpenStack VM: The Compute service runs in a paravirtualized virtual machine, on the host under management. Each host runs a local instance of Compute. It is also running an instance of nova-network. OpenStack Compute uses the XenAPI Python library to talk to XAPI, and it uses the Management Network to reach from the OpenStack VM to Domain 0. The above diagram assumes FlatDHCP networking. Management network: RabbitMQ, MySQL, inter-host communication, and compute-XAPI communication. Please note that the VM images are downloaded by the XenAPI plug-ins, so make sure that the OpenStack Image service is accessible through this network. It usually means binding those services to the management interface. Tenant network: controlled by nova-network, this is used for tenant traffic. Public network: floating IPs, public API endpoints. Before you can run OpenStack with XenServer, you must install the hypervisor on an appropriate server . Xen is a type 1 hypervisor: When your server starts, Xen is the first software that runs. Consequently, you must install XenServer before you install the operating system where you want to run OpenStack code. You then install nova-compute into a dedicated virtual machine on the host. When you install many servers, you might find it easier to perform PXE boot installations . You can also package any post-installation changes that you want to make to your XenServer by following the instructions of creating your own XenServer supplemental pack . Make sure you use the EXT type of storage repository (SR). Features that require access to VHD files (such as copy on write, snapshot and migration) do not work when you use the LVM SR. Storage repository (SR) is a XAPI-specific term relating to the physical storage where virtual disks are stored. On the XenServer installation screen, choose the XenDesktop Optimized option. If you use an answer file, make sure you use srtype="ext" in the installation tag of the answer file. For resize and migrate functionality, enable password-less SSH authentication and set up the /images directory on dom0. To support AMI type images, you must set up /boot/guest symlink/directory in dom0. Create a paravirtualized virtual machine that can run nova-compute. Install and configure nova-compute in the above virtual machine. When you use a XAPI managed hypervisor, you can install a Python script (or any executable) on the host side, and execute that through XenAPI. These scripts are called plug-ins. The OpenStack related XAPI plug-ins live in OpenStack Compute's code repository. These plug-ins have to be copied to dom0's filesystem, to the appropriate directory, where XAPI can find them. It is important to ensure that the version of the plug-ins are in line with the OpenStack Compute installation you are using. The plugins should typically be copied from the Nova installation running in the Compute's DomU, but if you want to download the latest version the following procedure can be used. Get the source from GitHub. The example assumes the master branch is used, and the XenServer host is accessible as xenserver. Match those parameters to your setup. $ wget -qO "$NOVA_ZIPBALL" "$NOVA_URL"
$ unzip "$NOVA_ZIPBALL" -d "$NOVA_SOURCES"
To support AMI type images in your OpenStack installation, you must create the /boot/guest directory on dom0. One of the OpenStack XAPI plugins will extract the kernel and ramdisk from AKI and ARI images and put them to that directory. OpenStack maintains the contents of this directory and its size should not increase during normal operation. However, in case of power failures or accidental shutdowns, some files might be left over. To prevent these files from filling up dom0's filesystem, set up this directory as a symlink that points to a subdirectory of the local SR.
To do so, generate an ssh key-pair with the ssh-keygen command. Ensure that each of your dom0's authorized_keys file (located in /root/.ssh/authorized_keys) contains the public key fingerprint (located in /root/.ssh/id_rsa.pub). dom0 space is at a premium so creating a directory in dom0 is potentially dangerous and likely to fail especially when you resize large servers. The least you can do is to symlink /images to your local storage SR. The following instructions work for an English-based installation of XenServer and in the case of ext3-based SR (with which the resize functionality is known to work correctly). The following section discusses some commonly changed options when using the XenAPI driver. The table below provides a complete reference of all configuration options available for configuring XAPI with OpenStack. These connection details are used by OpenStack Compute service to contact your hypervisor and are the same details you use to connect XenCenter, the XenServer management console, to your XenServer node. The connection_url is generally the management network IP address of the XenServer. The agent is a piece of software that runs on the instances, and communicates with OpenStack. 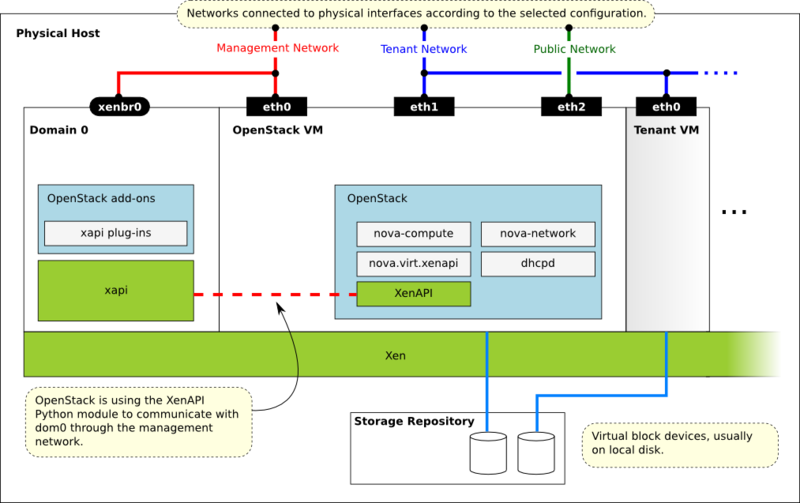 In case of the XenAPI driver, the agent communicates with OpenStack through XenStore (see the Xen Wiki for more information on XenStore). If you don't have the guest agent on your VMs, it takes a long time for OpenStack Compute to detect that the VM has successfully started. Generally a large timeout is required for Windows instances, but you may want to adjust: agent_version_timeout within the [xenserver] section. To customize the XenAPI driver, use the configuration option settings documented in Table 3.62, “Description of Xen configuration options”.